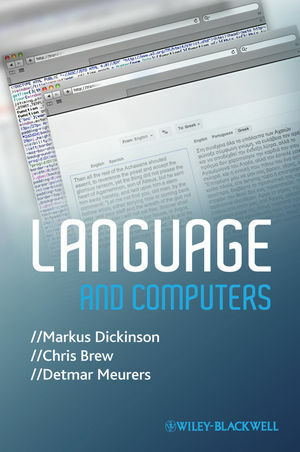 Language and Computers introduces students to the fundamentals of how computers are used to represent, process, and organize textual and spoken information. Concepts are grounded in real-world examples familiar to students’ experiences of using language and computers in everyday life. A real-world introduction to the fundamentals of how computers process language, written specifically for the undergraduate audience, introducing key concepts from computational linguistics. Features “under-the-hood” sections that give greater detail on selected advanced topics, rendering the book appropriate for more advanced courses, or for independent study by the motivated reader. Markus Dickinson is Assistant Professor at the Department of Linguistics, Indiana University and currently the director of the Computational Linguistics program. His research focuses on improving linguistic annotation for natural language processing technology and automatically analyzing the language of second language learners. Chris Brew is a Senior Research Scientist with the Educational Testing Service in Princeton, where he is currently the scientific lead for the c-rater project on automated short answer grading. He has been active in Natural Language Processing for over 20 years, first in the UK, then as Associate Professor of Linguistics and Computer Science at The Ohio State University, where he co-directed the Speech and Language Technologies Laboratory, as well as the Computational Linguistics Program. Detmar Meurers is Professor of Computational Linguistics and head of the Theoretical Computational Linguistics group at the University of Tübingen. He has a longstanding commitment to teaching Computational Linguistics and Linguistics in a way that combines current technology and research issues with the fundamentals of the field. His research emphasizes the role of linguistic insight and linguistic models in Computational Linguistics. His most recent research adds a focus on theory and applications related to second language acquisition.